Lapalma’s success has been achieved step by step throughout the years. No overnight success stories here - just hard work and passion in equal measure. For thirty years, the company has shown talent, tenacity, know-how and above all inexhaustible enthusiasm, expertly combining metal with wood, leather and fabrics to create timeless pieces of furniture with clean fluid lines. The genuine Italian nature of its products is stronger than ever, with its emphasis on craftsmanship and designs that appeal to the senses - the cornerstones of Italian design and production. 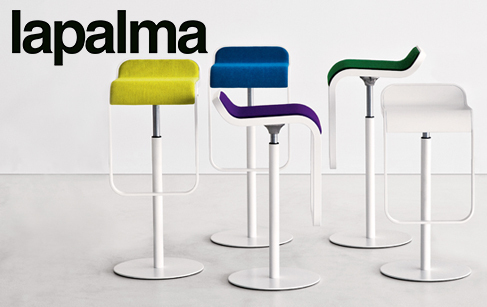 Lapalma’s blend of good design and aesthetic appeal produces furniture with a strong personality and has seen contributions from designers of international renown (as of 2013, Lapalma’s art director is Francesco Rota). The brand’s success has also been recognised with a number of awards, including the Good Design award, the FX International Interior Design Award and the Design Plus award. A diversified portfolio to accommodate products which are suited to the contract market, but can also cross over into other areas such as the home, outdoor and light office segments.